No matter what time of year or where you live, you must protect your skin every day to prevent premature ageing. These two powerhouse anti-age ing formulas by Zein Obagi, M.D. are designed to work together, offering maximum protection from the damaging effects of sun exposure and environmental pollutants and irritants. Following your regular skin care routine, apply 2-3 pumps of Ossential® Daily Power Defense over your face and neck every morning. Massaging skin increases absorption, penetration and stimulation. Follow with Oclipse® Sunscreen + Primer SPF 30. Titanium dioxide (8.2%): Broad-spectrum sunscreen (UVA rays/UVB rays ) protection. Helinathus annuus seed oil, ethyl ferulate, rosmarinus officinalis leaf extract and disodium uridine phosphate: Helps provide DNA protection. Glycine soja (soybean) seed extract: Helps provide DNA repair. 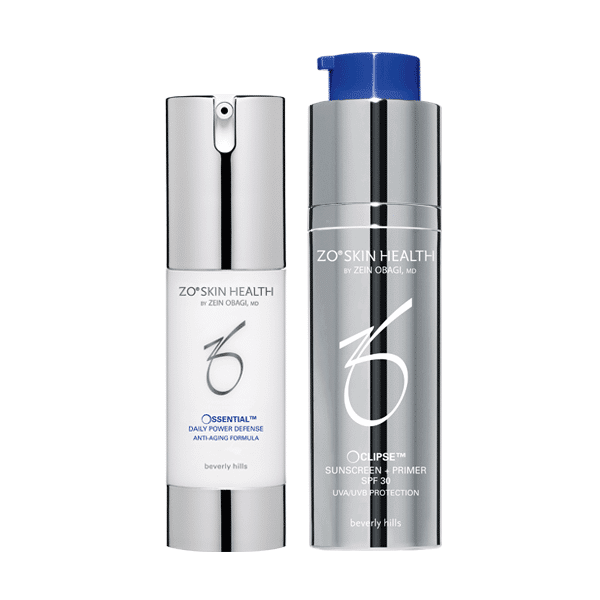 ZOX12™: ZO® Exclusive 12-hour time-release antioxidant complex (encapsulated vitamins A, C and E) helps protect the skin from free radical damage and prevents future signs of premature ageing, and also helps shield skin from harmful IR-A rays. Glycerin: Replenishing hydrator and moisture replenisher. Caprylic/capric triglyceride, behenyl behenate and squalane: 12-hour time-release antioxidant complex. Ultrasomes (UV-endonuclease) and roxisomes (glycosylase): Enzymes that initiate and speed the repair of DNA. Retinol: Stimulates epidermal renewal and collagen production; also helps even skin tone. Ceramide 6: Helps restore barrier function. Matrixyl 3000 (palmitoyl oligopeptide and palmitoyl tetrapeptide-7): Stimulates collagen production.